The Relentless Reader: Book Blogger Appreciation Week 2016 - Community Connection! 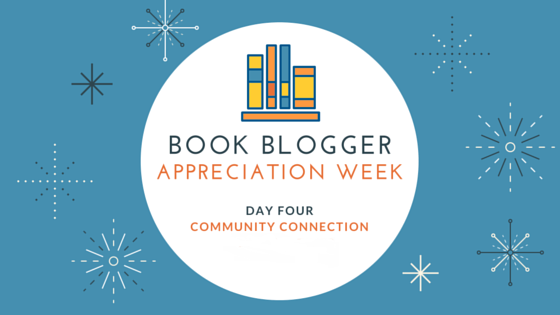 Book Blogger Appreciation Week 2016 - Community Connection! It's a well known fact that the best part of book blogging is the people. Of course the books are important but holy cats, the people. The people have saved me in more ways than one. Some bloggers send treats/cards/books, Some bloggers talk me down when I'm overwrought and overthinking. Some bloggers have walked me through personal struggles. Some bloggers have stuck by me while I've been in a reading/blogging slump for the past number of months. In other words, these bloggers are more than peers, they are friends. I also use a personal Facebook page and Goodreads, of course. My blog's Facebook page is chock-full of bookish news all day long. Behind the scenes there is a never ending stream of Slack chats, emails, DMs, PMs, IMs (wait, it's not 1998, I guess IMs have gone the way of the dinosaurs.) You get the drift. ...I do hope you'll come hang out with me! What are your favorite ways of staying connected to the community? For years I've been trying to come up with a better system for commenting. Some people say they have different folders in Feedly for different days of the week, but what if you go a week without commenting? Or can only comment once or twice a week? How do you choose who to visit? I end up getting so overwhelmed that I just head over to twitter for real time convo. :) But...book bloggers really are an amazing group of people, aren't they? Staying connected is a lot of work - sometimes I'm good at it and other times I'm not. Why is social media so much easier than commenting? Gah! I feeeeeeeeeeeeeeeel you. And, as always, your Gif game? On point. Yes, whichever way we choose to stay connected, it takes time. I'm a commenter, but I do take breaks from my blog and during those times I don't comment much. We all do what feels right and the main thing is that we have these great relationships, right? Oh, the commenting. I'm terrible about it. Most days I feel like I'm doing a great job just by getting a post up on my own blog and responding to comments there, or just reading a handful of posts in my Feedly. The weird thing is that commenting is my absolute most favorite part of blogging because like you said--the people! You're the best!! I'm trying to rejigger my feedly days folders so it's actually doable. But also that's woooork. Right now I am just loving instagram. I love following you on social media. You're always discussing something interesting. Isn't this community amazing, though? The people are where it is at, you are so right. It's always tricky to find the time to keep up with commenting! Some weeks I am awesome at it, and some weeks I convince I have to mark all as read. But it's worth it BOTH because I like maintaining the connection with my blogging friends, and because bloggers just write about awesome stuff! And I want them to know I'm reading and appreciating and adding things to my TBR list. I used to comment a lot on blogs. Everyone loves comments... I slowed down though on blogging last year and so that made my commenting to fall behind. Whenever I post something I try to bounce around the blogs I follow and comment then. I just don't get on everyday though like I used to. My secret? I have all of my favorite blogs post right to my email. Then, I skim through the posts I know I want to read and therefore comment. I then keep those emails in my inbox until I have time to read them and comment, usually once a week even though I try for once a day. Then, once I've commented, I can delete the email! You win the GIF awards every. dang. time.